This verse is one of the most practical we will ever encounter in the Bible. Every one of us faces needs in our lives; at times, they are beyond our own means. Those are not the times to become anxious or to panic. Nor should we give up in defeat. It is at these times that God wants to draw from His unlimited storehouse to meet our need as only He can. Do you believe God can meet the needs of your finances? Your health? Your children? Your parents? Your church? Scripture says you will never face a need for which God’s provision is not more than adequate. This promise appears over and over again in the Scriptures (Ps. 116:6; Heb. 4:16; Matt. 6:8; Ps. 69:33). If you are not experiencing God’s bountiful provision, what is the problem? 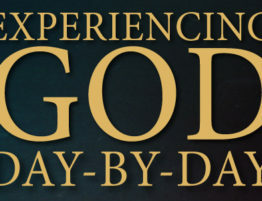 Is the difficulty with God? Or could it be that you do not really believe that God stands ready to meet your every need? Every resource of God is available to any child of God who will believe Him. No one has ever exhausted God’s supply nor suffered a shortfall when trusting Him. Unfortunately, some Christians live as if God’s abundant resources were not available to them. They are children of the King, but they live like beggars! Would the people close to you affirm that your life gives evidence of an unwavering belief that God will do what He said?